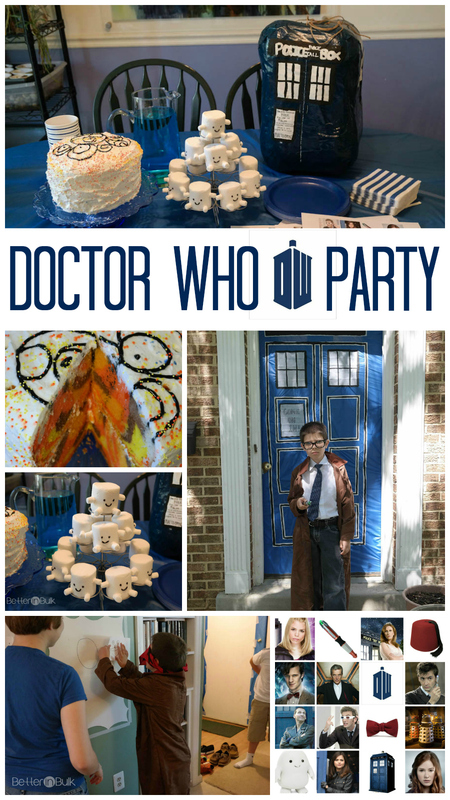 Before my youngest turned 10 last week, he declared that he wanted a Doctor Who themed birthday party. Now, throwing parties is not my thing. Parties take a whole lot out of me, and so I try to avoid being a party host as much as possible. But AJ is my youngest and he’s definitely had the least number of birthday parties over the years…and not just because he has had the fewest birthdays. 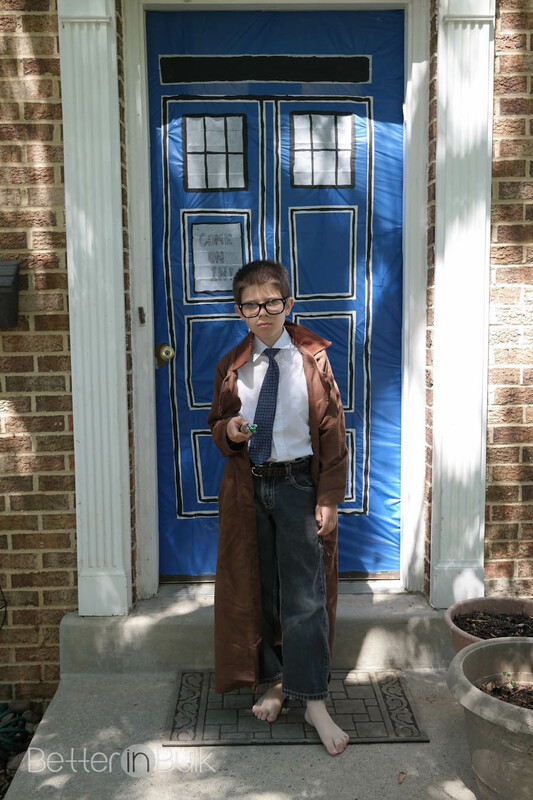 My little Doctor in front of the TARDIS “welcome” door before his party. 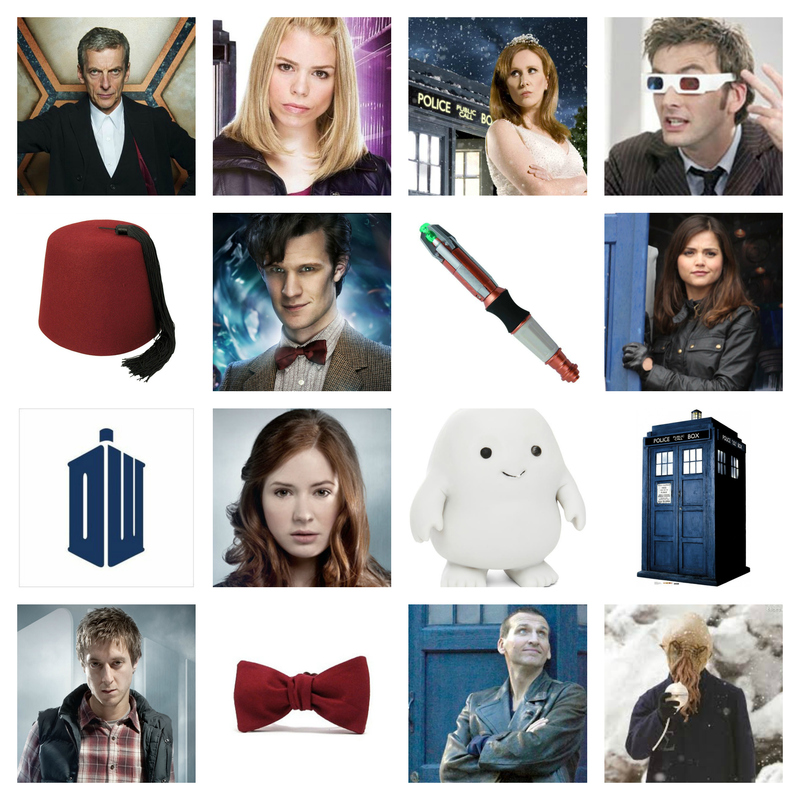 PS – apparently, Doctors don’t need shoes. 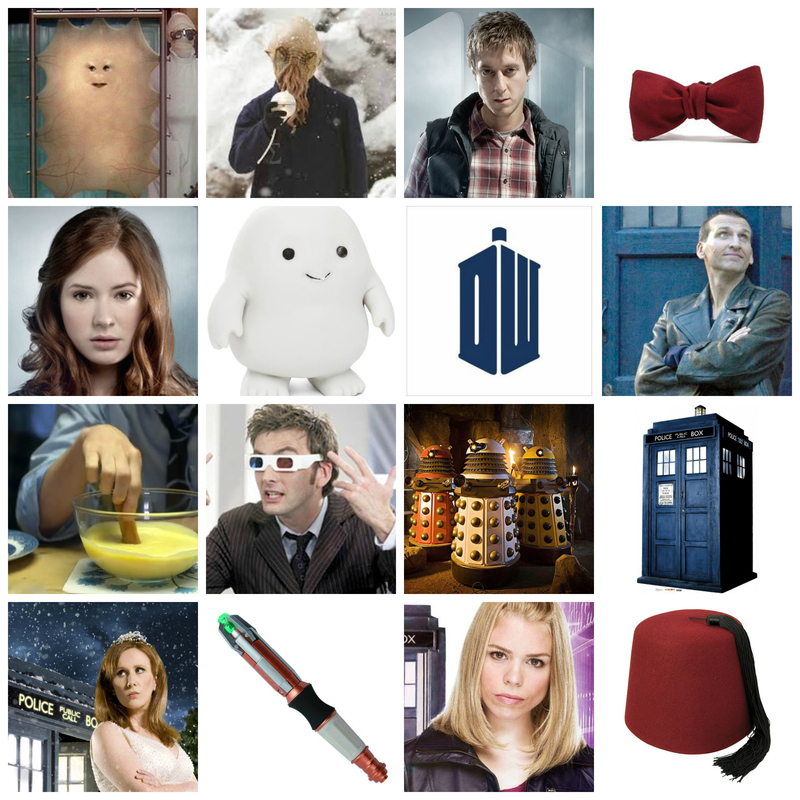 So I said he could have his Doctor Who themed party. 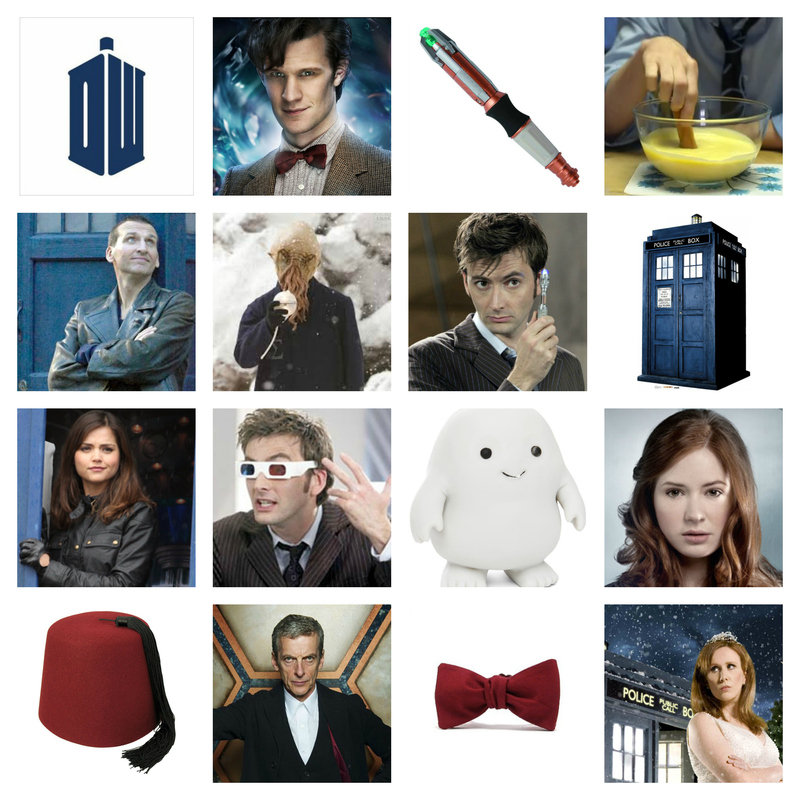 We made TARDIS invitations (I simply found an image of a TARDIS online and added his info in the windows and blue “boxes”) and sent them off to all of his friends. 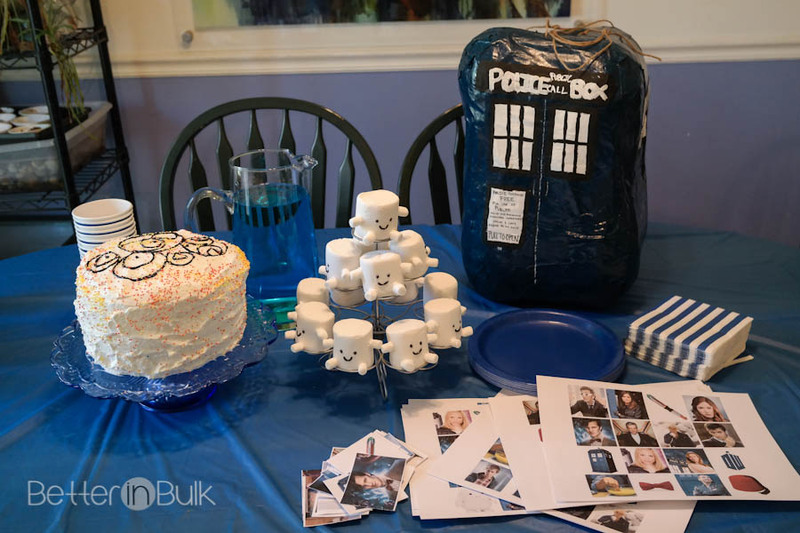 As much as the party exhausted me (I crashed in my room as soon as everyone left), we had a blast and I wouldn’t mind throwing another Doctor Who party sometime…in the future. 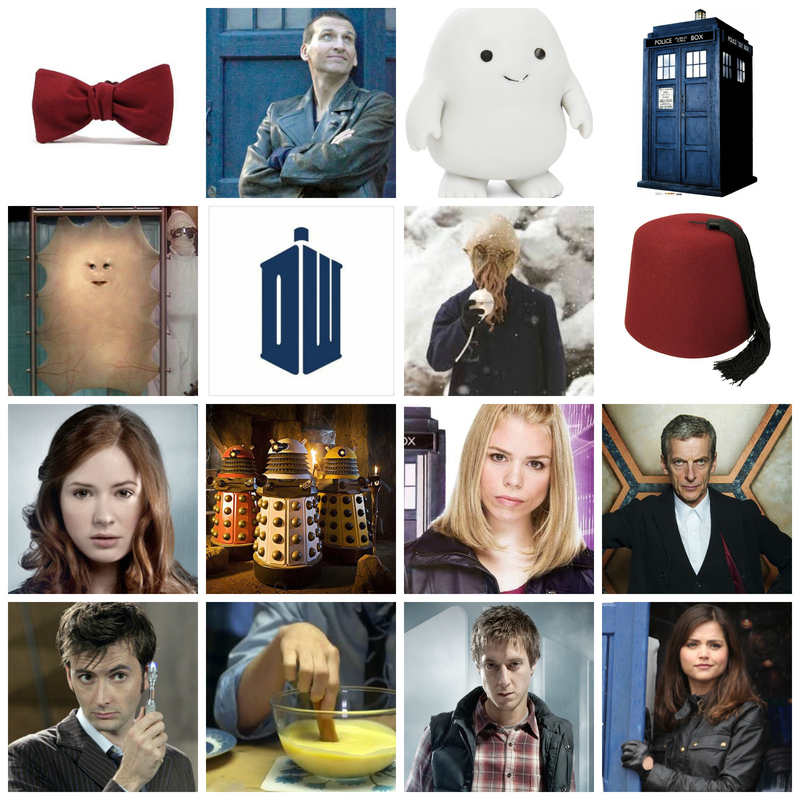 Even his friends who had never seen Doctor Who enjoyed the party! 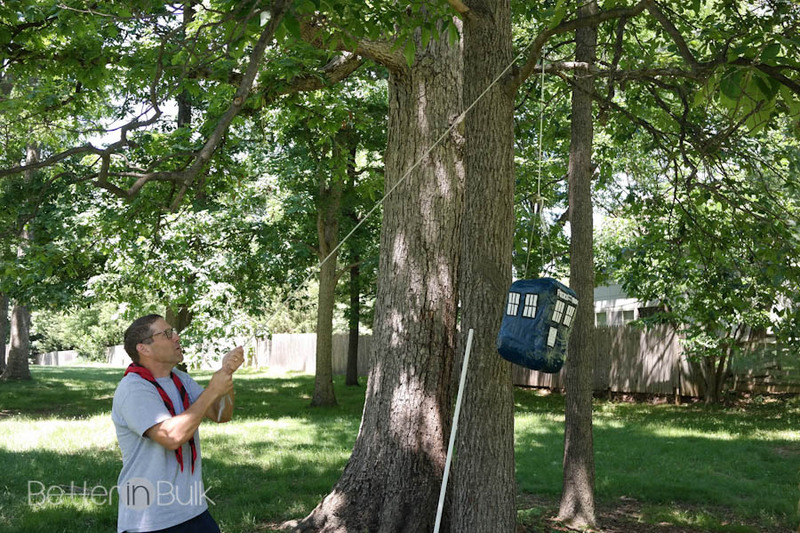 We played 4 Doctor Who themed games: Doctor Who BINGO, Blink-Don’t Blink (a Weeping Angels version of Red Light-Green Light), TARDIS piñata, and Pin the Face on Cassandra. 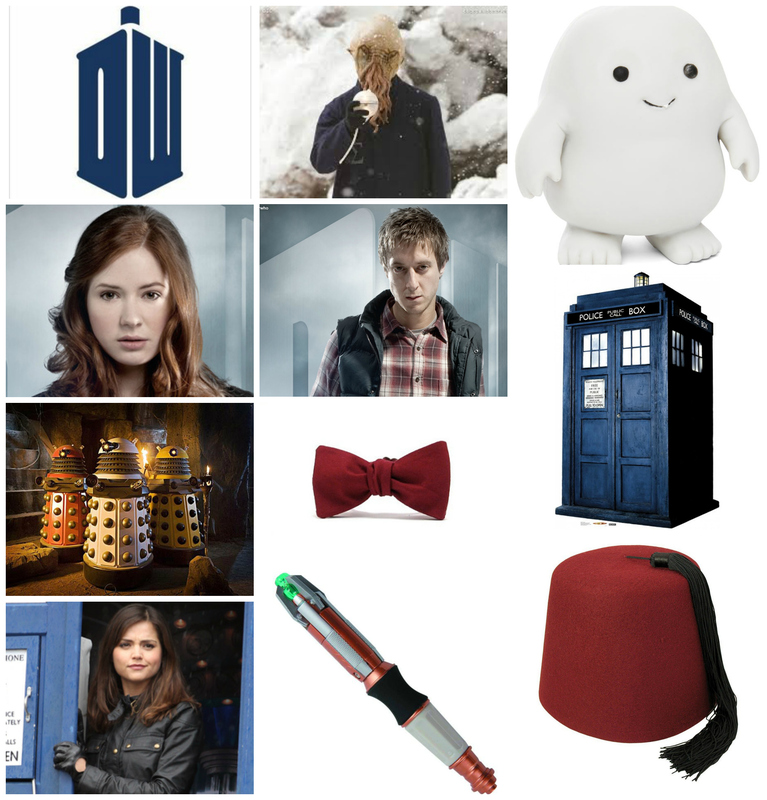 Amazon has some really cute and affordable Doctor Who mini figures to give out as prizes or as party favors. 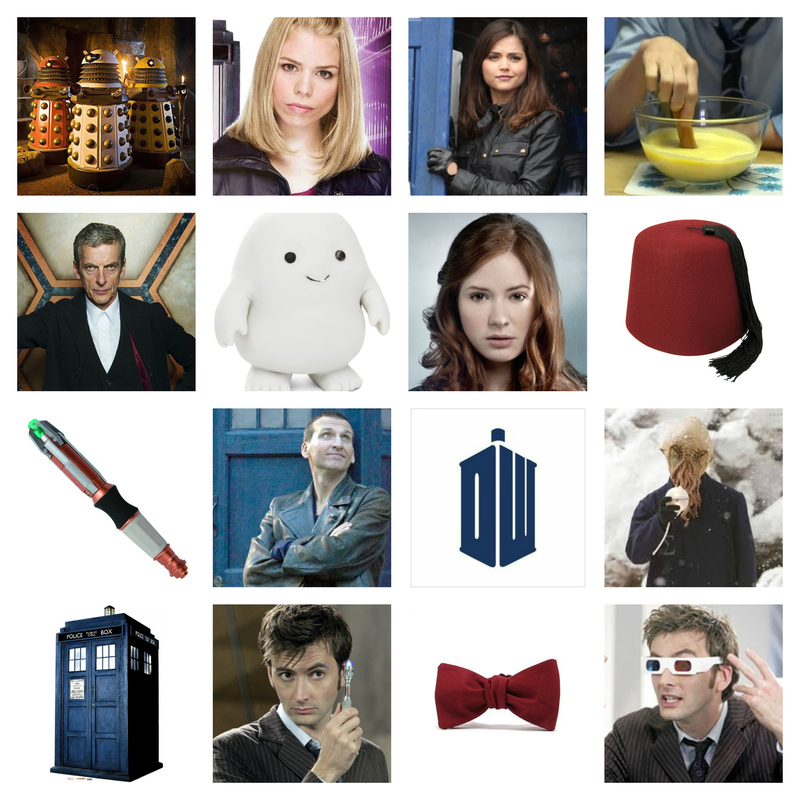 Doctor Who BINGO was a great way to get the party rolling, especially for the kids that didn’t know all of their Doctor Who lingo. I made up several BINGO boards and printed them off for each of the kids and then had a bag full of the “master” pictures. 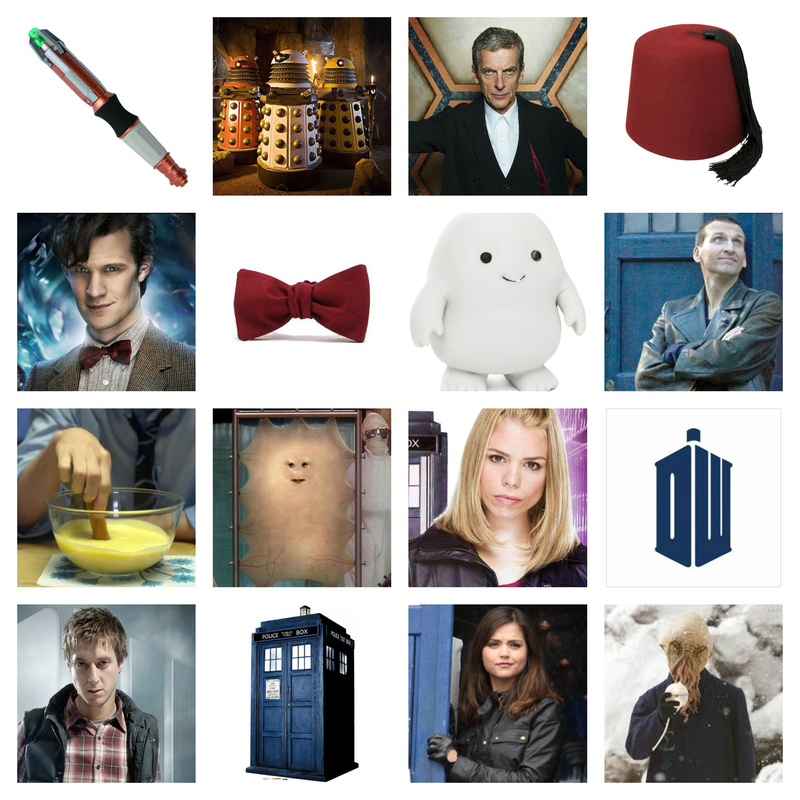 Because I love to share, I’m including the BINGO game boards here to download. 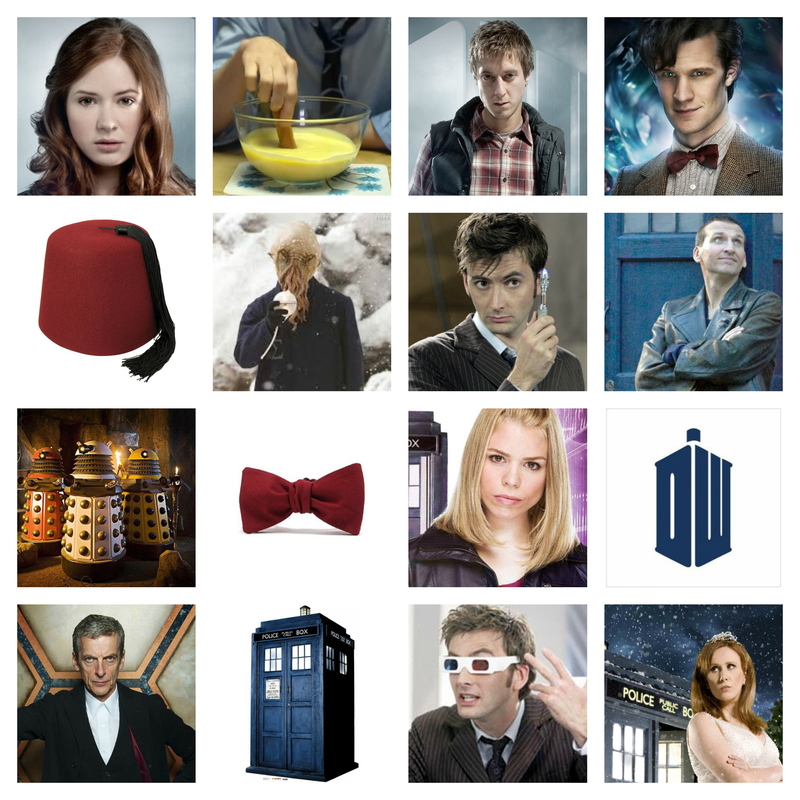 Just print them off and use them for your own Doctor Who party of game night with friends. 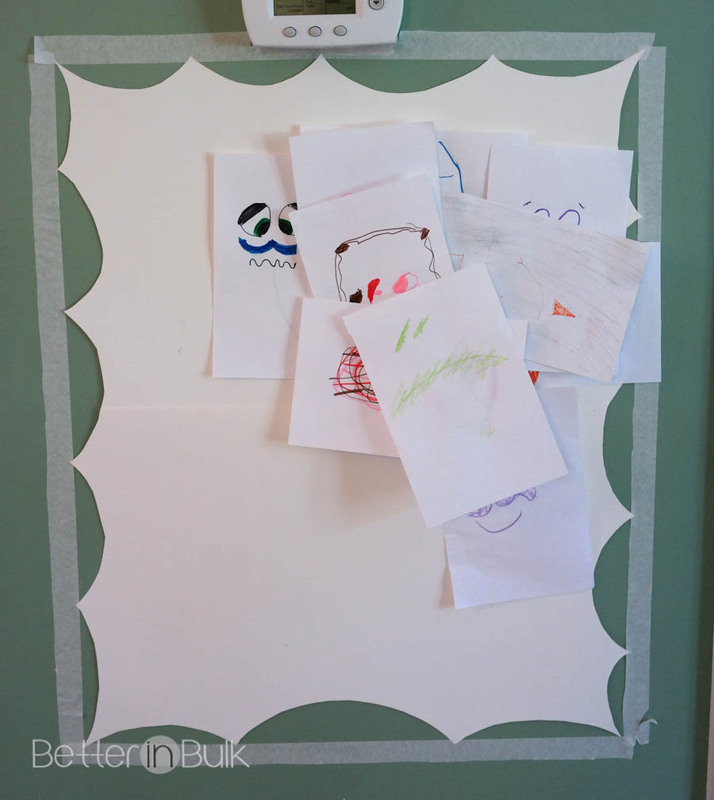 Use as many of the boards as you need, but be sure to print off the 2 master image sheets so that the “caller” can choose the square to call out. Note: I printed my game boards off on white card stock paper. Also needed: pennies or other small objects to mark each square as it’s called out. 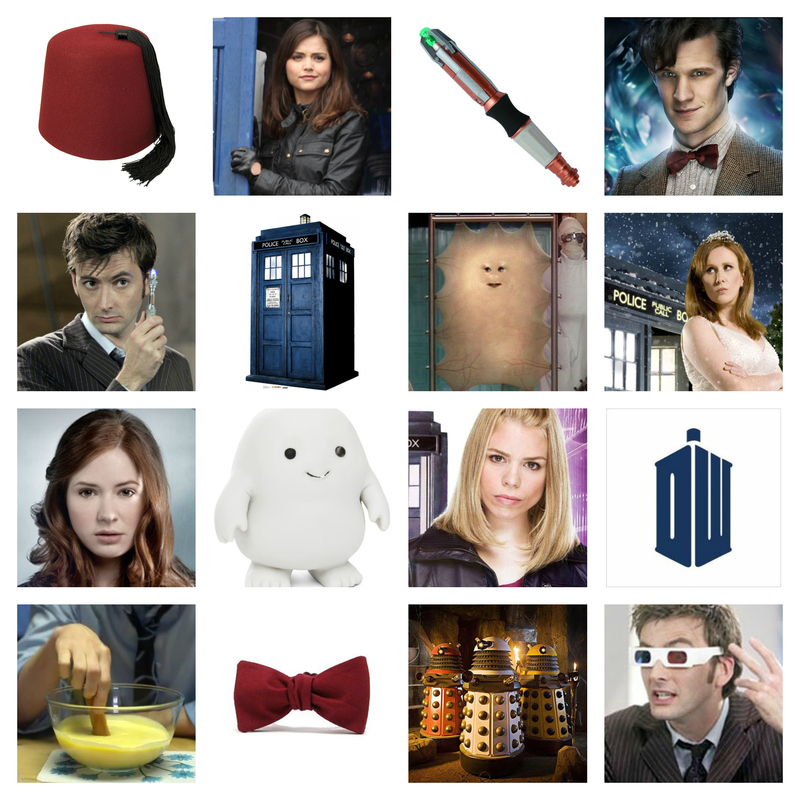 Blink-Don’t Blink is best played outside, or in a room with lots of space. 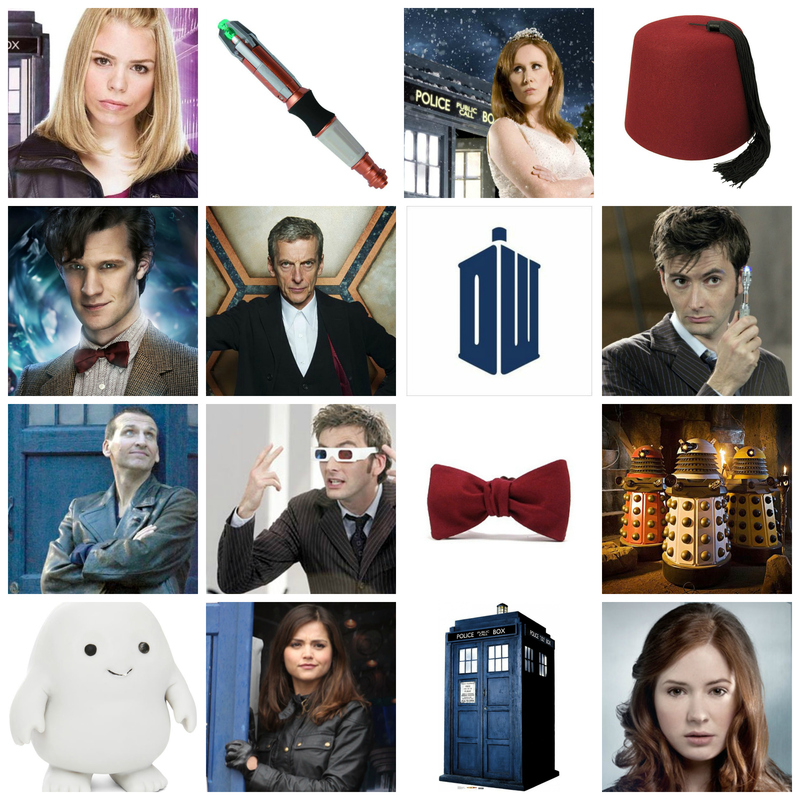 One child (leader) stands alone and the rest of the kids (the Weeping Angels) stand in a line at least 20 feet away. When the leader has his back turned, the Weeping Angels can walk or run towards the leader, but when the leader turns around to face the other kids, they must freeze. If the leader catches another child moving, they have to return to the start line. Game continues until one of the runners has tagged the leader. 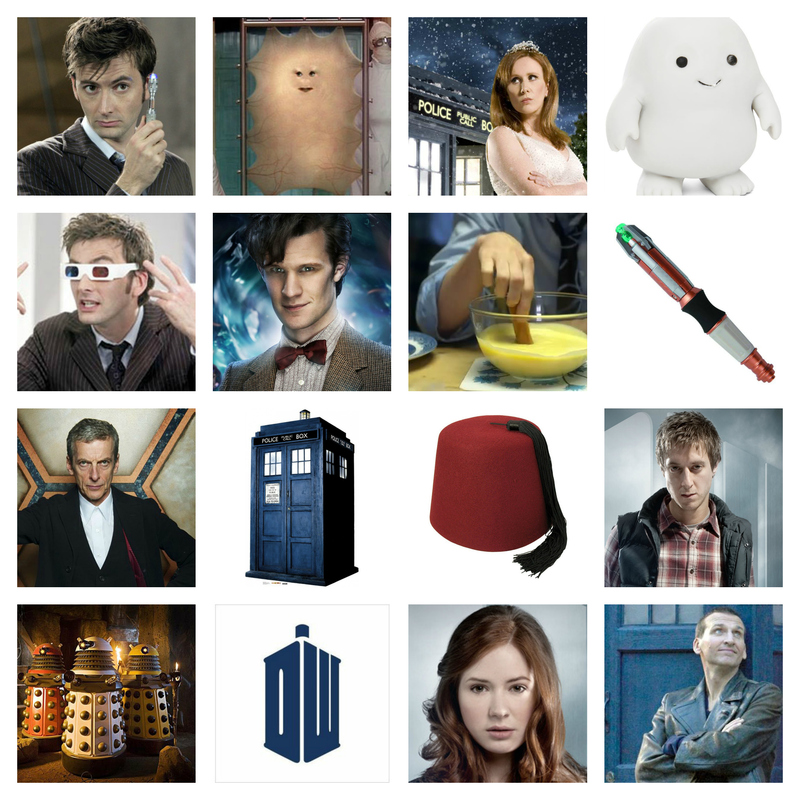 ALTERNATE GAME PLAY: If a “Weeping Angel” is caught moving, then he/she replaces the first child as leader. The leader can either be “out” or join the rest of the runners trying the catch the leader. 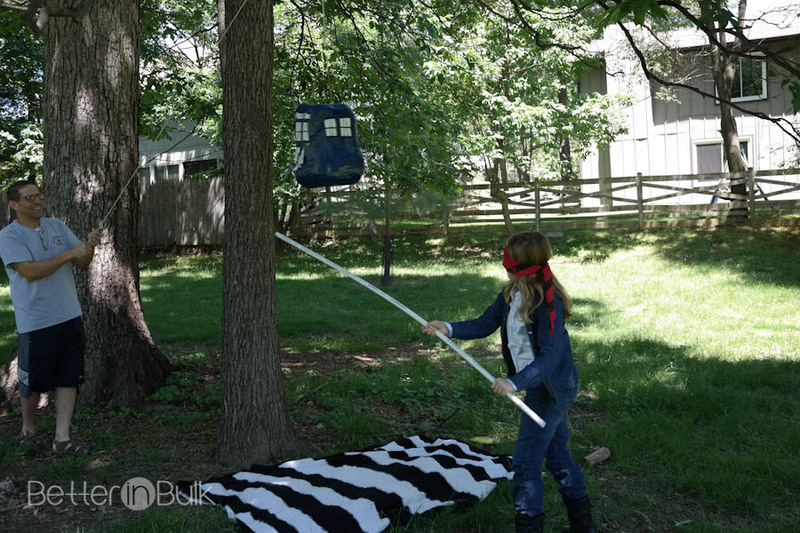 NOTE: I found a few TARDIS piñatas on Etsy if you’re not up to making one yourself. 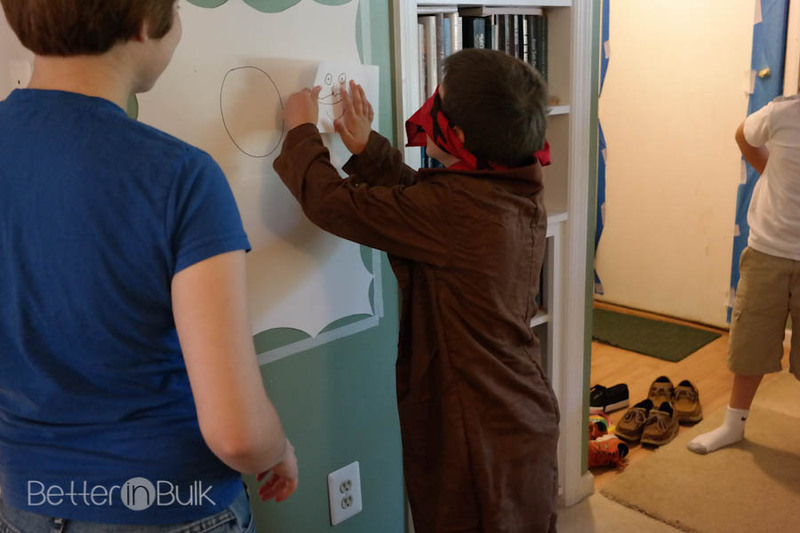 I love this version of Pin the Tail on the Donkey! 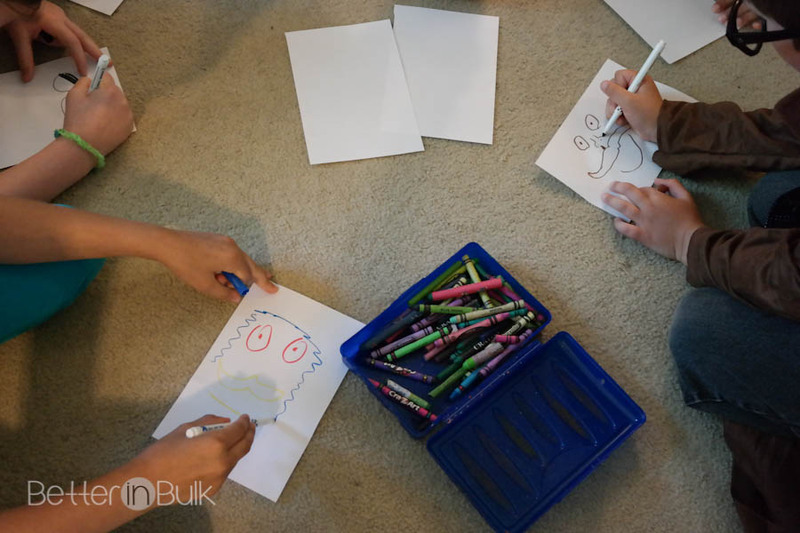 I started by giving each child a blank piece of paper and instructed them to each draw a face. We had some pretty creative faces! 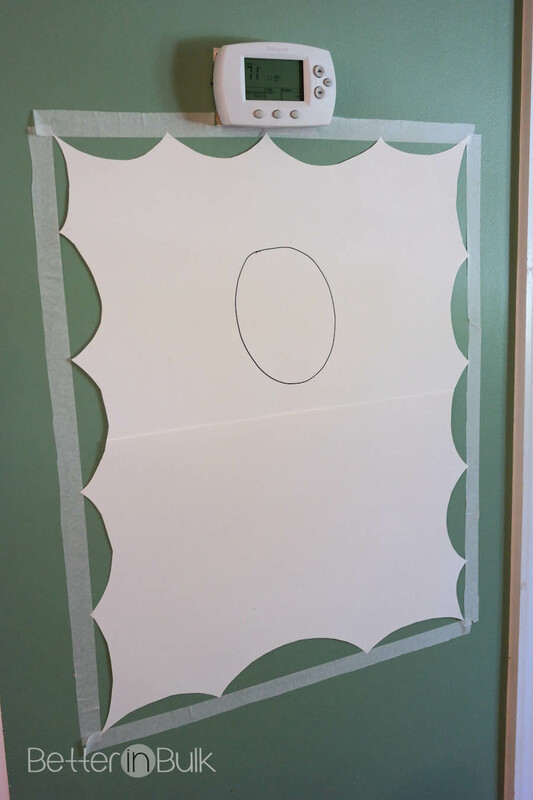 We taped a large piece of paper onto the wall (cut like Cassandra) and drew a circle where her face should go. Each child took a turn being blind-folded. I spun each kids around 3 times, and they tried to tape their face as close to the circle on Cassandra as possible. The kids had a blast “directing” their friends towards Cassandra! 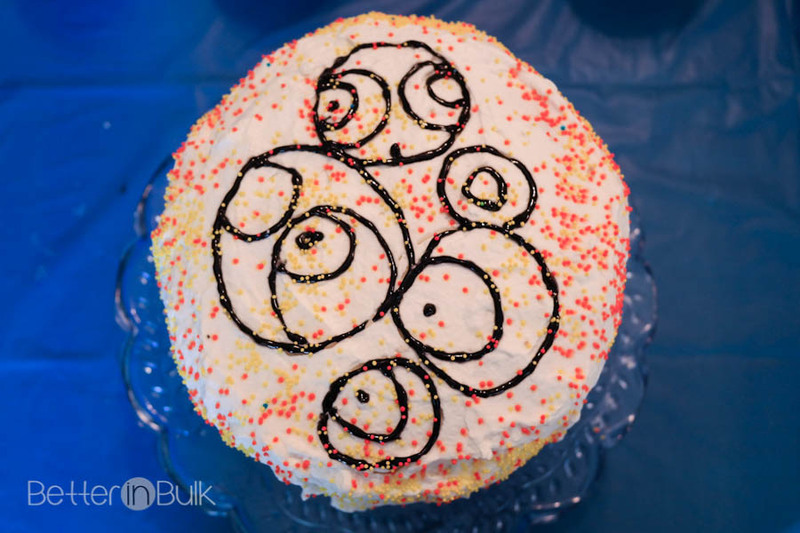 I was planning on making a TARDIS sheet cake, but after having such success with the blue zebra cake I made for his actual birthday, I decided to make a Gallifrey Cake using the same method. I colored white cake mix orange, yellow, and brown and layered the colors in two round cake pans. 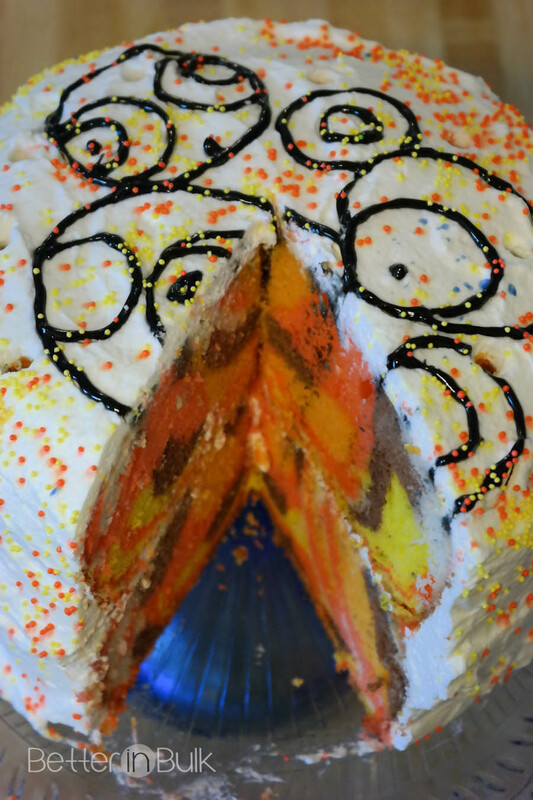 I covered the entire cake in homemade whipped cream and yellow and orange sprinkles, and then wrote a few Gallifreyan symbols on top (someone asked if it spelled out AJ’s name in Gallifreyan, and NO I am not fluent in Gallifreyan, so those are just random letters…). 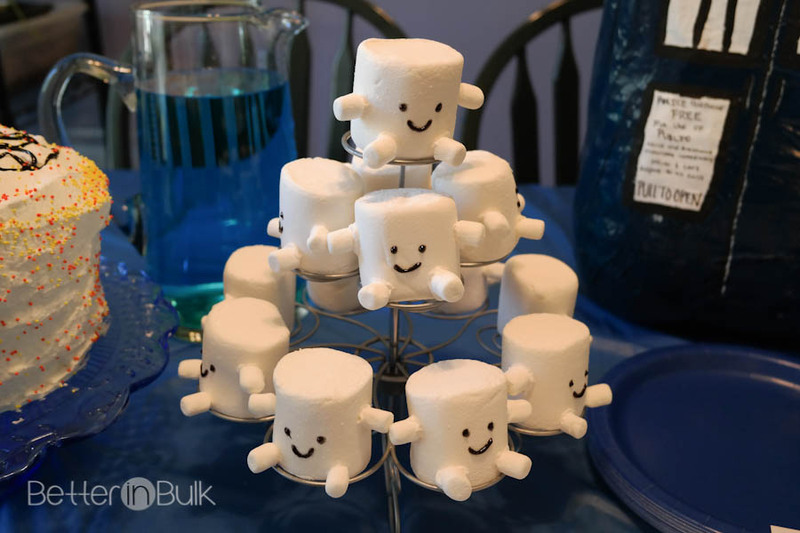 I thought it would be fun to make a few Adipose with Jumbo Marshmallows for the bodies and mini marshmallows for the arms and legs…and it WAS fun! I had no idea how popular they’d be, though! 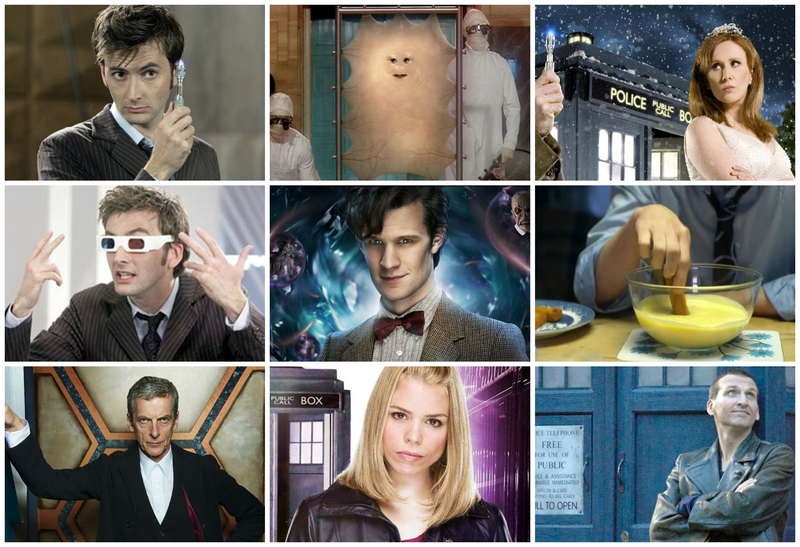 More kids ate Adipose than cake and ice cream. We had to throw a few more together in the middle of the party. Luckily, they’re super simple to put together. I used edible frosting cement to “glue” the arms and legs onto the body and then drew the eyes and face on with a small tube of black frosting. 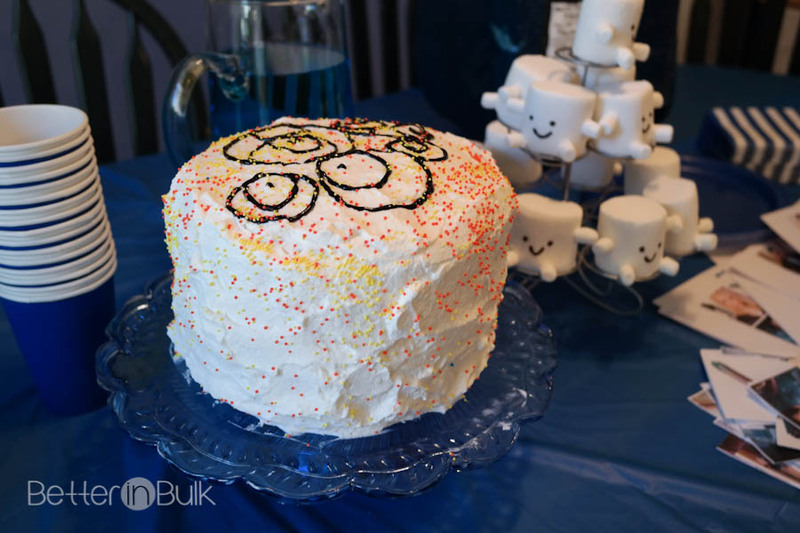 For a fun display, we sat the Adipose around a cupcake holder. 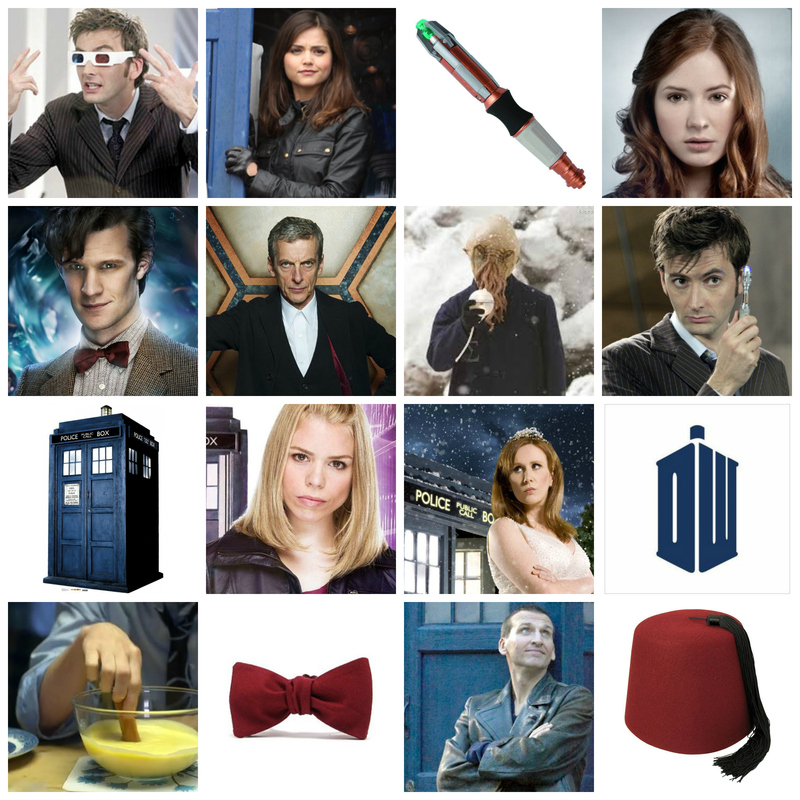 We also served Time Lord Soda (Sprite mixed with blue Gatorade) and P-P-Pizza. I was originally planning on serving the traditional fish fingers and custard, but I ran out of steam and worried that 10 year olds wouldn’t eat it, anyway. What an amazing party this was! You came up with some really great and fun ideas!